No need to load up city water to start work, or to stop several times a day for refills when your AllJetVac is equipped with the Vacall Recycler. Vacall Recycler continuous water recycling system is a "Green That Works" option for AllJetVac combination sewer cleaners that can save time, increase working efficiency and conserve our natural resources. The Recycler system vacuums water from sewer lines puts it through a five-step filtering process and then uses the same water to continue jetting. Located in the front of the debris tank for protection against stones and other vehicles, the Recycler system also includes a 240-gallon segregated clean water tank section attached to a 10 gpm pump and 50' hose reel for wash down. 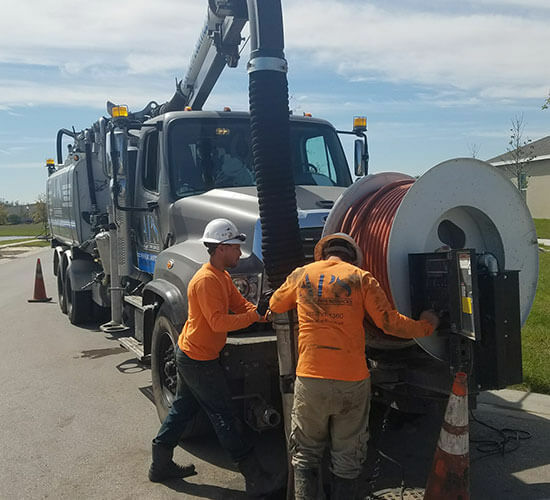 One Vacall AllJetVac combination sewer cleaning truck can save an average of 5.7 million gallons of city water each year when it's equipped with a Recycler continuous water recycling system, which typically requires no city water at all. The water savings calculation is based on typical municipality usage statistics – using 80 gallons of water per minute, six hours per day, five days per week and 40 weeks per year. Individual city water savings may vary, based on jetting activity.